The older I get, the less flexible I’ll become, right? WRONG!! Stretching SAUncategorizedThe older I get, the less flexible I’ll become, right? WRONG!! As you grow older, there is no need to grunt and groan when you get out of the chair or shuffle when you walk or turn your whole body to look at what’s going on next to you. Although, there is an acknowledged biological decrease in natural flexibility as a person ages, there is increasing evidence that the decreases in physical function we commonly associate with aging are not entirely related to advanced years, but rather to sedentary lifestyles. When aging is accompanied by increasingly sedentary lifestyles, muscle atrophy is almost always the result. And once this happens, it is difficult to regain that muscle mass with strength training and regain flexibility with stretching. But it can be done. There are compelling reasons to so. Improved nutrition and medical support make it possible for us to live longer, so it is increasingly important for us to take care of our bodies in which we are going to live for a long time. Researchers tell us that the decline in flexibility means declines in stability, balance and mobility – all contributing to falls which is deadly in the elderly. Equally deadly is the restriction of spinal mobility, which causes compression with severe impediments in cardiovascular functionality. The Axiom “Move it or loose it!” just might be a lot more important than you think then. 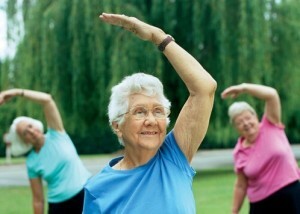 Apparently it is never too late to start with aerobic, strength, and flexibility training. Researchers have found that programmed, regular exercise (3 days a week for 20-30min. per session) significantly improves all three in both men and woman. To improve the quality of our time on earth, working out is very important.